After the opening of the Mallee Routes exhibition at Atkins Photo Lab in Adelaide I linked up with friends in Mildura to drive to see the Warlpirri's Milpirri Festival at Lajamanu in the Tanami Desert in the Northern Territory. It was a 3 day drive. 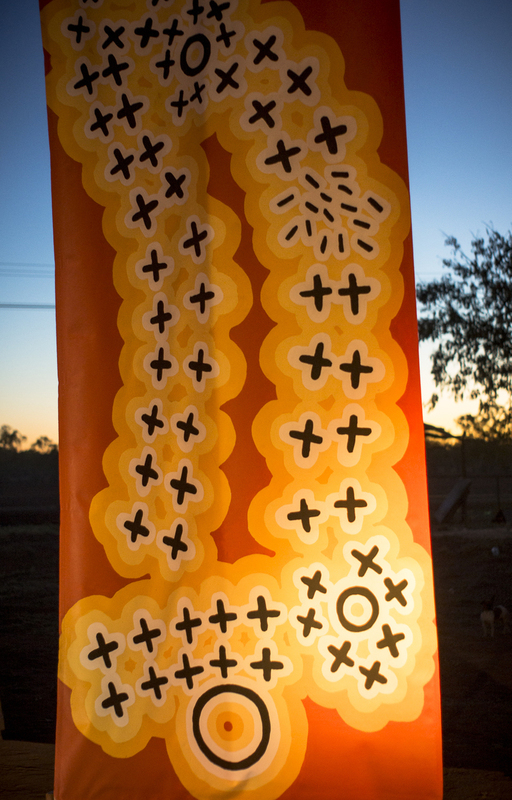 This is one of the posters that surround the stage at the Milpirri Festival; the huge painted banners retell the stories from the different family groups that have been learnt. The photo of the poster was made at dusk with my digital camera. I was at the limits of the capacity of the Sony NEX-7. Though it was an improvement on 400ASA film, I couldn't go beyond 800 ASA. Friends, who were using more modern digital camera's (such as the Sony A7 or the Fuji X-Pro 2), could work with ASA settings 3 times that. Unlike me, they were then able to photograph people at the festival after dusk with minimal lighting. It became clear to me that I'm using old digital technology. Things have improved in the last 4-5 years. I was impressed by the Fuji X-Pro2 (an APS-C), which is a high-end, rangefinder-esque mirrorless camera. In the hand It felt like a Leica M film camera, it was best at traditional film style 35mm photography. The image quality looked excellent, and the colours very filmic.